If there is really such a thing as too much of a good thing, then we don’t want to know. We will, without hesitation dive into any and everything Tidelands over and over again. They could play the kazoo while herding cattle through a steel mill and we would be absolutely captivated. Their increasingly impressive sound is done one better by the release of a combined effort with San Francisco’s Indie Pop artist Debbie Neigher. Their 7” vinyl release is one side, “Smile,” written by Neigher, and the other “Atoms,” by Gabriel Leis. Together, they are where beautiful arrangement meets intelligence and dreamy vision. Each track will be played on repeat the moment you hear them. Their ability to make two songs feel so much larger than life is absolutely awe inspiring. The blend of Neigher and Tidelands is a dynamic we had never thought of, but won’t soon forget and it begs the question: Is there nothing these artists cannot do? Fans of Debbie Neigher are sure to fall in love with Tidelands and fans of Tidelands will become drawn to Neigher. At the time this is published, the only known way to get your hands on this is by grabbing the actual vinyl; and we kind of want it to stay that way. Years from now, when the world wakes up to acknowledge the splendor and power of Gabriel Leis, Mie Araki and Debbie Neigher we can sit back and listen to this gem without the digital world marring it. Sure, purchasing the 7” supports your fix for fantastic and truly indie music on vinyl, but it also helps keep good music alive. It will be available at Stanford Music Library. If you’re a fan of indie, if you’re a fan of vinyl or if you’re a fan of good things – no matter how much you may have of it – get this. 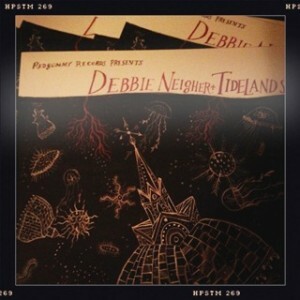 This entry was posted in Singles/Videos and tagged 7", Debbie Neigher, Indie, music, pop, review, San Francisco, single, Tidelands, Vinyl by Greg. Bookmark the permalink.